Being that I love wine, and love having a monogram/initial displayed, I figured I would give this a try. The website linked to the pin gives some basic instructions, but I like a more detailed play by play. I modified it a bit, but actually made it before we started the blog, so I don't have many pictures to go along with it. First, I ordered a bunch of corks from ebay because I didn't think I had enough at home. I got 100 for $11.50 plus shipping (a lot cheaper and a more sober option than trying to drink 100 bottles!). Second, I didn't use a wooden letter cutout, I just traced a wooden "V" I already had from Michaels and display on my fireplace mantle onto a thick piece of cardboard and cut it out. 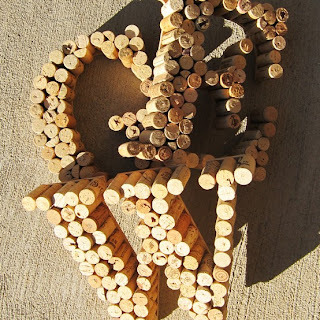 Next, I played around with the layout - trying to figure out where I can fit whole and half corks. Once I figured it out, I went to work cutting the corks I needed. This was the worst part. I tried a couple different methods (after a quick google search), and discovered using a sharp utility knife worked the best - and it still wasn't pretty. It didn't exactly make a clean cut and I had little pieces of cork all over my office. Thankfully I only needed 6 halves so I only had to do it 3 times. Next up I fired up the glue gun and got to gluing them down. This went pretty easy and quick. The downside to using a piece of cardboard instead of wood is that the edges arent very pretty. To remedy this, I decided to use a piece of ribbon along the outside of the whole thing. 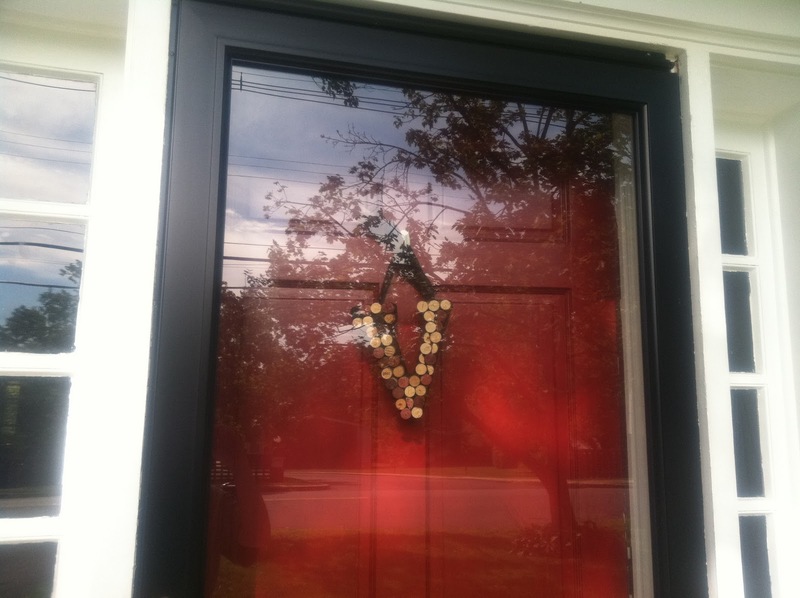 Then I just attached a bow using the same ribbon and hung it up on my door! Verdict: I like how it turned out, and I was done in about an hour. I would also use a solid ribbon instead of sheer. You can see the glue through it if you look at the sides. I will probably change out the ribbon color when I take it down and hang up something else for fall. Also something to consider - not all corks are the same height. I am ok with that, I like the variation (that's also why I used some with the red side out and some with the red side in), but if you are looking for symmetry and a smooth surface, that's going to take some additional planning. Like I said, I am happy with how it turned out. Perhaps it is not as pretty as the one from the pin, but I think it looks great on my front door. I can wonder though if my neighbors think we are alcoholics? Oh my gosh, I LOVE this idea! I think I have my next craft lined up. Thanks for sharing! I saw that pin on pinterest too and was wondering about how it could be done! It looks great! 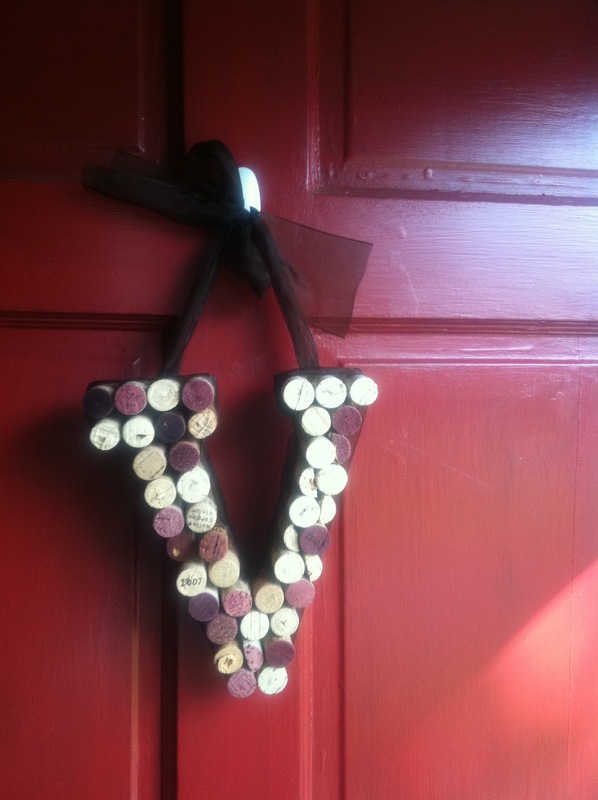 My mom loves her wine and has about a million corks saved, so this would be a great idea for her. Thanks for the detailed instructions and the critiques at the end! 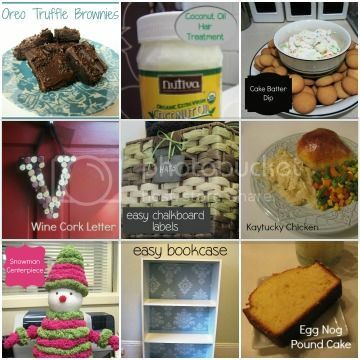 I found your post/blog through Bower Power's Pinterest Challenge and of course 'pinned' your post to my boards! It is now on my "Christmas Gifts to Make" list! I will take pictures and post credit to you on my blog (www.tammyskinner.com) when I am done! So glad you all liked it! Be sure to share your results!